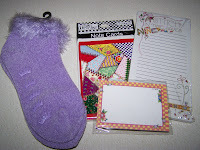 I haven't blogged in awhile. 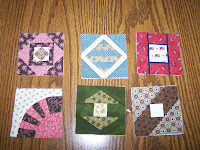 I've been busy working on blocks for a 3 inch swap that I'm in at our Dear Jane retreat. We don't show these blocks to each other until we swap them on Friday at the retreat. Then I realized that I could show you the 6 blocks that I made for the last round. There are 7 of us in the swap this time, and we pick 6 blocks from anywhere and make one for each person in the swap. I also got good mail this week. My friend Jackie who has been living in Alaska for awhile sent me a package yesterday. She is now back in California. Jackie is my un-secret pal from several years ago, and she sent me an un-birthday present. That is a long story that would tend to incriminate some people. All for now. 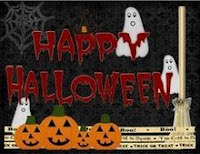 Have a good day!!! It's fall in Indiana. 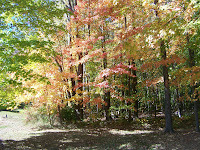 The leaves are gorgeous. I spent some time Sunday afternoon raking, and it was going great until I hit a bee hive (or something) next to our house. They swarmed, and I ended up with a half a dozen stings. One of those stings was in my head. That really didn't feel good. I finished this Dear Jane triangle yesterday. This has been a long term project that I hope to finish soon. I've been working on it longer than I worked on the Nearly Insane quilt. Here is the photo of my finished Nearly Insane top. Thanks to the girls at Quiltmakers for holding the quilt while I photographed it. I should tell you that I've started Nearly Insane 3 times, but from what I hear from others that is pretty normal. The 3 or 4 blocks from my first attempt were made into needle books by a friend doing projects to sell to raise money for a worthy cause. OK. Yes, I did buy back one of the needle books made from one of those blocks. I got a bit farther on my second attempt and have almost 8 of those blocks. I'm going to make those into a small quilt. 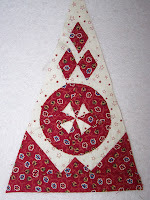 Then I saw Hanne's red and white blocks and decided I really liked the two color quilt. 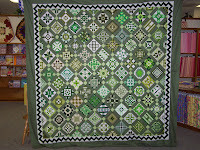 The quilt is made up of 98 blocks some of which are half blocks that go along the edges. Each block is 6 inches finished. The total quilt measures 96 1/2" inches. Do any of you remember back when we only had 3 or maybe 4 TV channels? On Sunday evenings we would gather around the set and watch The Ed Sullivan Show. I remember this one guy that would come on stage with a bunch of poles that looked like dowel rods and a stack of dinner plates. He would start one plate spinning then start a second, third, etc. etc. Then after awhile the first plate would slow down so to keep it from falling off and breaking he would run back to that first plate and give it a turn. Well, I am kind of like that guy with my quilting and knitting projects. I work on one for awhile then another and another. 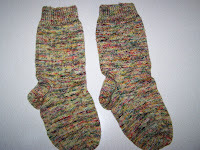 But, I'm happy to say that I've finished my first pair of socks made from Koigu. I've made a pair from worsted weight yarn, and I love them. 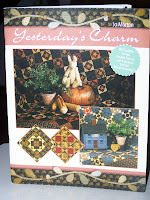 I went to my local quilt shop last week and bought Jo Morton's new book, Yesterday's Charm. I'm still working on my Nearly Insane quilt. After I finally finish that one I will want to work on some smaller projects for sure. Now I'm off to the sewing room.